I know... how can anything so adorable be so angry? We have been experimenting with stuffed animal patterns here. One of Caitrin's really good friends is moving away to New York City, and we wanted to make her a memento that people could sign. Since her favorite color is pink, this Ambrosia print was perfect. 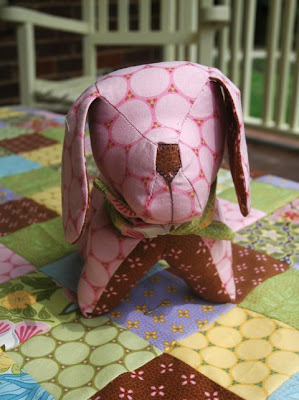 The puppy pictured, made from a really cute pattern by Indygo Junction, was the unfortunate victim of a bad sewing day, hence the name - thanks kids! It was one of those days where I couldn't get a seam to line up, no matter how many pins I used. (We all have them. If you are like me, you insist on not admitting it and battling it through to the bitter end.) We covered her less-than-perfect neckline with a little hankerchief, and she ended looking looking like quite stylish in the end. But Angry Dog was too small for twenty kids to sign, so we had to make Happy Teddy. Happy Teddy was the felicitous product of a good sewing day - one where ridiculously long seams line up without using any pins. Don't you LOVE those days? 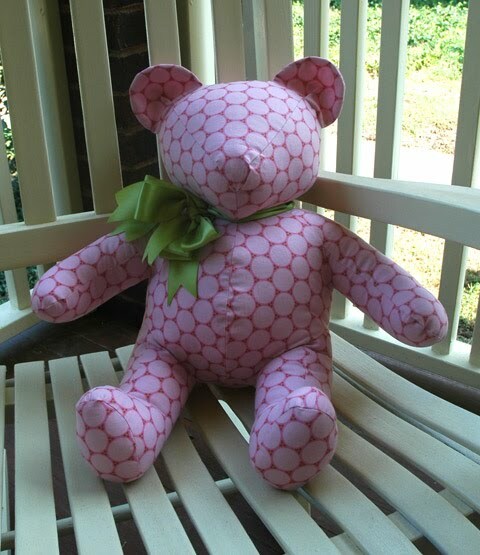 He is from a pattern called "... and the Three Bears" by Possibilities/Dream Spinners. I can't find in on the net, but I bought it at Cross-Stitch Junction on Hilton Head Island, South Carolina, if you are interested. They had these bears made up in many different fabric lines and they made a great display. 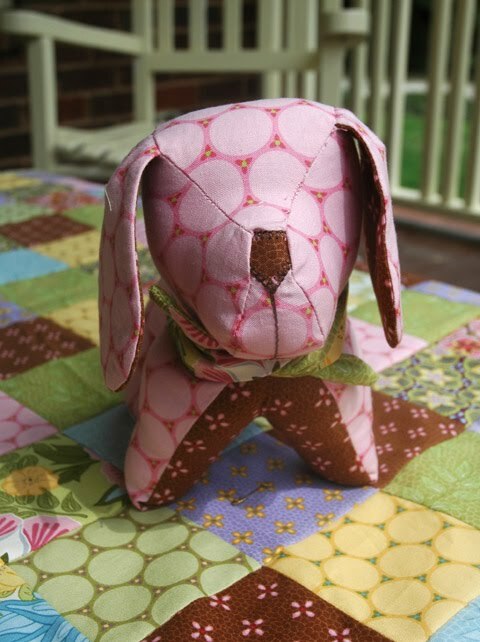 Next, I want to make a teddy out of those patchwork squares that are being stampeded by Angry Dog. I think Happy Teddy looks ready for her trip to the Big Apple, don't you? Oh I love these! I made many teddies 20 yrs ago and somehow got away from it. I'm digging out those patterns this weekend, now I can't wait to see them in new fabrics!